As we predicted earlier this year, a major Peer Lender has gone belly-up, reminding many of Bernie Madoff’s Ponzi scheme that collapsed in 2008. But instead of a carefully constructed fraud that endured for decades, the Chinese Peer Lending platform Ezubo siphoned $7.6 billion dollars from investors in two years. Peer Lending has exploded in China, from about $38 billion USD in 2014 to $151 billion USD in 2015. This $7.6 billion dollar fraud represents 4.6% of the Chinese Peer Lending market and affects more than 900,000 investors. This raises another concern for potential investors – not only does a lender risk loss from borrowers not repaying, but they now have to worry that their money could be embezzled by a marketplace’s management. There are two types of risk associated with any asset class: systematic risk and unsystematic risk. Systematic Risk is the risk inherent in the entire market. As an example, during the ’08 crash nearly all stocks, regardless of their individual strengths, decreased in value. This type of risk cannot be diversified away by investing more in the same market – buying more stocks won’t help if the entire stock market tanks. Peer Lending has been shown to have near zero correlation to the stock market, making it a good asset to add to a portfolio. Unsystematic risk is the risk inherent in each individual investment. The biggest risk when lending money is the inability or unwillingness of the borrower to pay back. Three approaches help in lowering that risk: credit scoring, guarantees, and diversification. Lenders can minimize their risk by investing a small amount in many different loans. 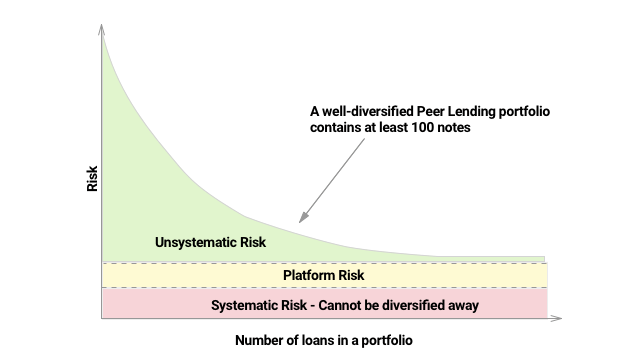 This mode of diversification is crucial to the general attractiveness of Peer Lending. Aside from diversification, both credit scoring and borrower guarantees can be thought of as Platform Risk, since the end investor has no control over either (other than to perform due diligence and the ability to invest in multiple marketplaces). This ‘platform risk’ is a key difference between Peer Lending marketplaces in China and the United States. The largest platforms in the United States have taken steps to limit platform risk for the end consumer. There are partnerships between each marketplace and qualified custodians, loan-servicing companies, originating banks, scoring agencies, investment advisors, and more that are all monitored by the SEC or other government bodies. But while the SEC has taken an active interest in Peer Lending since 2008, the Chinese Peer Lending ecosystem only started implementing regulation in mid 2015. Chinese Regulators have their hands full trying to check in on more than 2,500 (and growing) Peer Lender platforms. The Peer Lending company Ezubo attempted to sate client fears by providing credit scoring on business who were ‘unable to obtain credit at traditional banks’ and guaranteeing those loans with the underlying asset supposed to be used by the loan proceeds. In reality, Ezubo had few outside legitimate business partnerships – their entire business was built on a house of cards that collapsed once government scrutiny began. China may not be out of the woods yet – this past December the China Banking Regulatory Commission listed 1,000 Chinese Peer Lenders as “problematic.” Although Ezubo is the largest Peer Lender to collapse, there are sure to be more to follow.